For the final two weeks of July, LeBow hosted top high school students from the region and across the country for Camp Business. Since its inception in 2002, Camp Business has featured courses taught by LeBow faculty in the disciplines of economics, accounting, marketing, finance and management as well as the core concepts of business including leadership, professional image, team building and strategy. The students get to know each other and Drexel University by staying in residence halls and participating in scavenger hunts and field trips. The camp’s two weeks are split between residential and commuter sessions for students who either travel from a distance or live nearby. 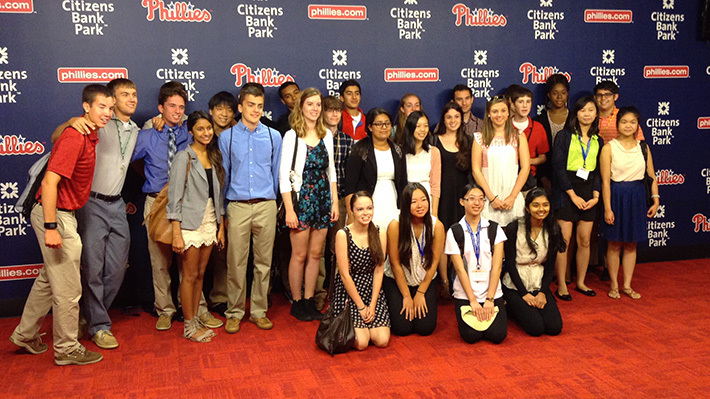 For their field trip, this year’s commuter-week campers were treated to a behind-the-scenes tour of the Phillies’ facilities at Citizens Bank Park. The wisdom (and wit) of the campers was on clear display during the Q&A portion of the tour. The campers peppered Stephanie Nieland, a Phillies sales representative, with questions about the effect of the Phillies’ dismal season. Under the students’ insightful questioning, Stephanie conceded that selling tickets is more challenging when the team has a losing record. At that, Jacob Borowsky raised his hand to offer a suggestion: “I’m not a professional, but I would recommend more Dollar Dog Nights.” The campers laughed at his deadpan, no-nonsense delivery, and Stephanie admitted that it might be time for more special promotions. The suggestion was tongue-in-cheek, but it was evident that Jacob and his fellow Camp Business attendees were in a problem-solving mindset after developing business plans all week. Each camp session wraps up with students applying their newfound knowledge and skills in the Mike’s Bikes business simulation. Anyone who happened by the case classrooms on the fourth floor on presentation day likely noticed some very intense, and professionally attired, high school students pacing the hall and practicing their presentations. Teams presented financial results, strategies, and business concepts to a mock board of directors, who selected the winning team which were recognized at the closing ceremony. With top students from the region; others representing Texas, Kentucky, California, Colorado and Florida; and even a student from Saudi Arabia, the presentations were impressive and highly competitive. The quality of their Mike’s Bikes plans made it evident that each camper will return for their final year of high school with a taste for experiential education.